Tired Of Not Feeling Fine? Can you remember how good you felt 5, 10, even 15 years ago? If you don’t make a choice to do something now can you imagine how the next few years will alter your home life, hobbies, and your ability to support your family? Dr. Lewis and his team are here to help you live a life worth living. Call us today for a free consultation. 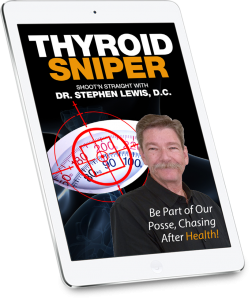 ‘Thyroid Sniper’ by Dr. Stephen Lewis, D.C. The Thyroid is such a powerful part of our body and learning how it works will give you clarity on many symptoms you may have experienced. Be part of our posse, chasing after health! Contact Green Wisdom Health today to receive a quick and comprehensive health assessment. Using the results from your lab work or your health assessment, we create an in-depth plan featuring a comprehensive treatment regimen based on your symptoms. Our pharmaceutical-grade supplements are shipped directly to you in a standard USPS Priority Mail box. We don’t guess. We test. If you have any questions, feel free to contact us anytime. You can call us at 1 (903) 663-1008, or email us at janet@greenwisdomhealth.com.